We love crosswords! In this book you can solve our best 100 award-winning, easy crossword puzzles from American celebrity crossword makers such as Liz Gorski, Patrick Merrell, John Samson, Kelly Clark, Victor Fleming, Sam Ezersky, Andrew Ries, or Harvey Estes. 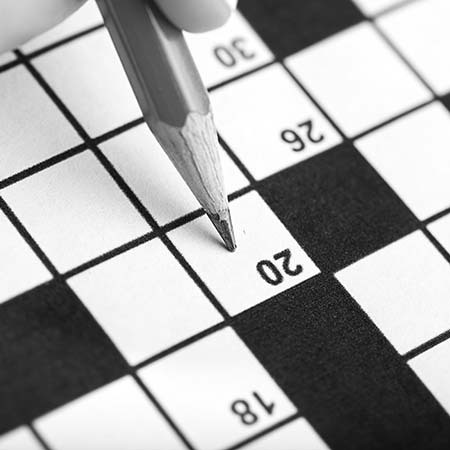 All these puzzles have been highly rated with at least 4 stars out of 5 by the American crosswords community (including thousands of avid players). All is compiled into a practical paperback book that you can take easily with you wherever you go. You can buy this book here. This book contains 203 Sudoku puzzles of difficulty "EASY". It is meant for beginners and everyone who enjoys playing Sudoku. Keep your brain fit and young with Sudoku! For the players' convenience is the solution to each puzzle always included only a few pages after the puzzle. - Small format, though large, very readable print on white paper. - The book has extra wide center margins, so you can solve all puzzles well, even if you want to fold the pages or separate out individual puzzles. This book contains 203 Sudoku puzzles of difficulty "MEDIUM". It is meant for the advanced players and everyone who enjoys playing Sudoku. This book contains 203 Sudoku puzzles of difficulty "HARD". It is meant for the expert players and everyone who enjoys playing Sudoku.